"This is kind of creepy," said M., looking at the forest floor around her. The ponderosa pine-needle duff was scraped and gouged as though a wrestling match had taken place. 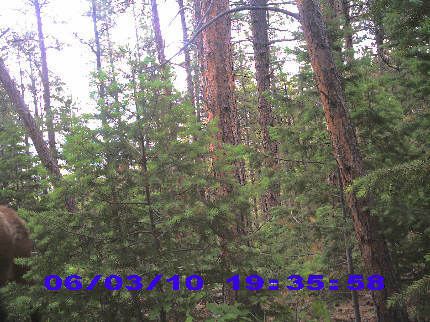 More seriously, my game camera was no longer strapped to the big pine where I had left it. The battery compartment door was over there, the main control-panel cover somewhere else, and the silver C-size batteries gleamed in the underbrush. Best of all, the camera body itself was in the spring. So was its nylon mounting strap. 1. Bear. The torn-up ground, the muddiness of the camera, a paw print near the spring, and the general destructiveness suggested Ma or Pa Bruin. 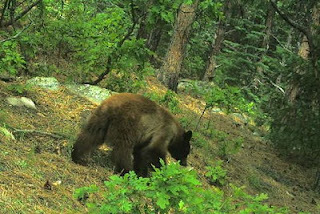 Plus I had gotten bear pictures at the same spring on May 26. 2. Human. Someone had unbuckled the strap. On the other hand, a hostile human would have likely just taken the camera--or picked up a stone and smashed it to ruin the electronics. Or shot it with a gun. 3. Bigfoot. Just in case we ruled out numbers 1 and 2. But hurray for secure digital (SD) cards. At home I pulled the card from the camera, wiped the mud off with alcohol, and downloaded 51 images. 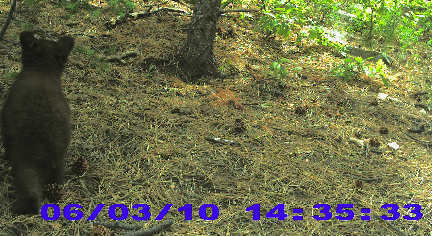 The three foxes were back on the morning of June 2. 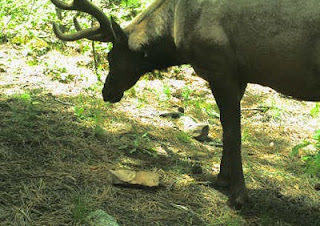 Just after noon the same day, a bull elk in velvet came to the spring. Around 10 a.m. on June 3, something knocks the camera askew. Here is the probable culprit. Two minutes later, someone is back--or had never left. 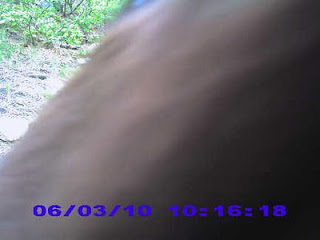 Then four hours later, around 2:30, the camera captures a shot of a brown ear, a total white-out as though something blocked the lens, and then this bear cub walking away. 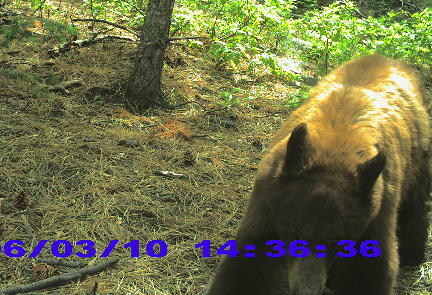 A minute later, Mama Bruin comes back. Maybe she is getting annoyed now? At 3:15 p.m., mama and cub depart. 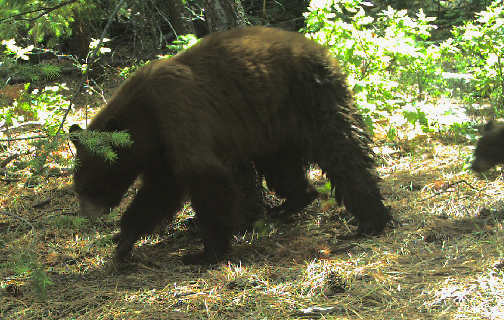 It looks as though the adult bear waded into the spring up to its elbows and then sat in it, since its hindquarters are muddy and there is no other open water nearby. But wait! 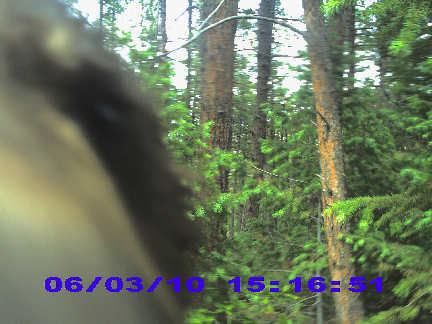 Let's smack the camera around some more! This photo was followed by others of the camera pointing 180° from its original position, and up towards the tree tops. A bear--presumably the same one--came back around 7:35 p.m. In this photo you can see brown fur to the left. At 7:38 the camera was being knocked around again. (Was this when the bear unbuckled the mounting strap?) 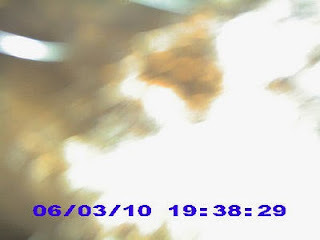 For ten more minutes, the passive infrared detector was still being triggered, although the photos were only of tree tops. And at some point it was "disemboweled," its batteries came out, and it was deposited in the spring. There it lay for three days until we returned for it. No, it does not seem to work. The case is water-resistant, but there is a limit to that. And the clear plastic disk covering the lens appears to have been bitten. That's fascinating and a little funny, too! I wonder if it was a smell that they didn't like, just recognized it didn't belong, thought it might be edible, if they were playing with it or something else? Sorry it's broken, but it was good fun while it lasted! oh, bummer. will you get a new one? Exciting waiting to see what else is going to show up. Probably the sound attracted it. Too bad about the camera. M. Loup: Digital cameras make no sound to speak of, so perhaps Otowi was right, and the scent and general strangeness triggered the bear reaction. gl: I have two others--and one more coming! Sorry for the loss of your camera- you were getting some really great shots, those of the fox cubs were particularly nice. I think bears just sometimes get annoyed at human artifacts. In AK a few years ago we were on a boardwalk trail- 2 by 12s nailed to 20" diameter log cross pieces about 3' long- right up until we got to the point where a (brown) bear decided he didn't like the trial. Whole sections were ripped up and tossed dozens of feet away. Nice shots! I've thought of putting a gamecam in my yard, but probably the most exciting that would get is perhaps a mockingbird attack. What a great series of shots, Chas! 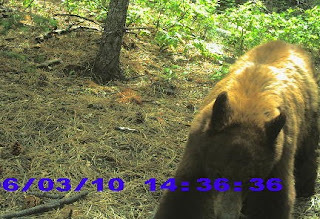 I've never used a trail cam, but am increasingly tempted to get one. How far behind the cabin? I think my M needs to see those pixs. They are great and it is a great story! Up and over that ridge east of the house--there is a thickly grown bowl on the other side -- it's a half-section of BLM land.